Fort Worth Plumbing – What Tool To Use To Remove Drain Clogs? Signs Of Serious Plumbing Problem By Lightfoot Plumbing. Almost everybody knows how annoying a clogged drain or a stopped up toilet can be. Clogged drains and clogged toilets are one of the most common occurrences in a home. Fortunately , a plumber’s snake can be a great gizmo to have in the event of a plugged drain. A plumbing snake is a flexible auger used to get rid of clogs in pipes that cannot be removed with a plunger. Most snakes contain a coiled metal wire with space between the coils at the end. The other end is attached to a device with a crank that revolves the wire as it moves down into the pipe. The auger end of the wire digs into the blockage very much like a corkscrew, allowing recovery of the item securing the clog when the snake is pulled out. Also, a clog can be removed when the end of the snake breaks up the clog, allowing it to pass thru the drain. Before employing a plumbing snake, it is critical to understand the ways to use one. 1. Set Up : Before employing a plumber’s snake, make sure you have towels and a bucket to gather any water which will run over on the floor. Put on gloves because the snake wire can get grimy and slimy. 3. Feed in the Plumbing Snake : start with the smallest snake that you have. If it does not work, employ a larger one. Feed the snake’s head into the drain. Revolve it a bit in a clockwise direction as you slide it thru the pipe. Be careful not to damage sinks, toilets, and pipes. 4. 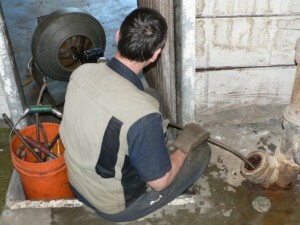 Locate the Clog : Keep feeding in the snake while rotating till you hit the blockage. Keep repositioning the grip within a couple of inches of the entry way to the pipe as you feed the snake into the drain. If you cannot locate the obstruction, run the snake in thru the branch pipe. If there does not appear to be a block in the branch pipe, the blockage might be in the main waste and vent stack, or in the sewer line. You will have to call a plumber. 5. Collect the block : when you have reached the blockage, revolve the head of the snake till you can feel it latch on to the block. Once you have a good hold, withdraw the snake out of the drain. You may push the snake and chew away at the clump until the snake is driven thru it. If it’s a thick and solid clump, then use the snake to gnaw away at the clog. When you pull the blockage back, it may start to become untidy. This is where a bucket and towels becomes obligatory. 6. Eliminate Remaining waste : you will have to get rid of the leftover pieces in the drain. You can do this by running hot water down the drain for a couple of minutes to bathe away any remaining debris. Now having said all this some times the “do it yourself” method doesn’t help much and you need to call a Professional Plumber! So don’t hesitate and give us Lightfoot Plumbing a call if the job is bigger then your ambitions.